Written in spare skeletal prose, Controlled Hallucinations paints surrealistic scenes for the reader by means of suggestion and inference. With 63 untitled poems, Williams dwells in a realm adjacent to the linguistic canoodlings of the Language Poets. Not quite self-referential, but attuned to the cadences and imagery implicit in language itself. 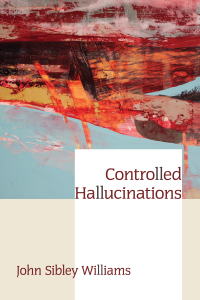 Controlled Hallucinations is a thin volume of poetry. One should resist the temptation to plow through it in a day, an afternoon, an hour. Lighter, lyrical poetry can be consumed quickly, ear-worms burrowing delicately into the subconscious. These poems are best consumed, like a good scotch or a morel, a little at a time. Each poem jerks you out of reality, either by grammar that breaks the fourth wall or arresting images that linger, enclosing the taste buds, hedonistic and strange. Not the taste, but the aftertaste. I read these poems one or two at a time, on occasion I might indulge and read five. These poems make you think, but not in a hectoring, didactic tone of a televangelist or social media scold, but they make you think like a David Lynch movie or a Remedios Varo painting. They aren’t immediately strange, but become more uncanny the longer one contemplates, rolling the phrases on the tongue, and then ingesting them, their meanings sometimes flowering in the reader’s consciousness, sometimes not.